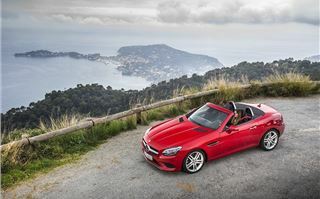 Soft-top cars and diesel engines aren’t particularly obvious bedfellows – or so you would think – but 70 per cent of SLK Roadsters were powered by diesel. It’s a trend that’s expected to continue in the new model, which is now called the SLC as Mercedes-Benz tries to structure its badging a bit more systematically. For a cost-conscious buyer or company car drivers the SLC 250d’s emissions of 114g/km speak for themselves, as does the official economy figure of 64.2mpg. 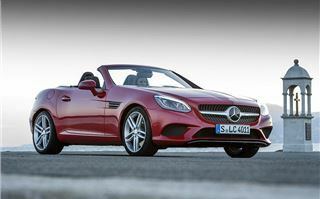 But there have been plenty of other improvements throughout the rest of the car as well. 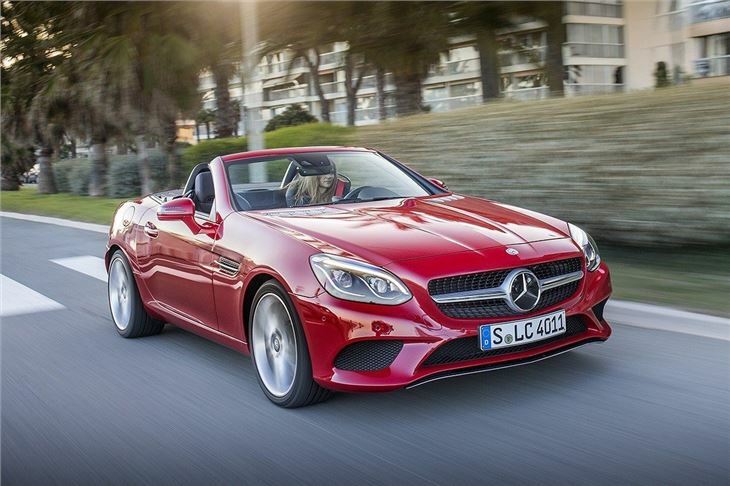 The styling tweaks are the most obvious – new headlights, a fresh grille and redesigned tail lights make the SLC look like a smaller version of the pricier SL-Class. Optionally the new headlights can be upgraded to adaptive LED units, which adjust to the road conditions and weather, recognising fog and differing road situations like corners or motorways. Inside, the instrument binnacle has been redesigned and materials have been given a once-over, making the SLC feel like a better quality car than it used to as the SLK. 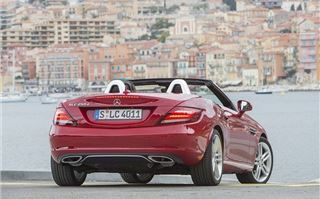 That said, the layout is showing its age now – especially compared to the new C-Class and E-Class. 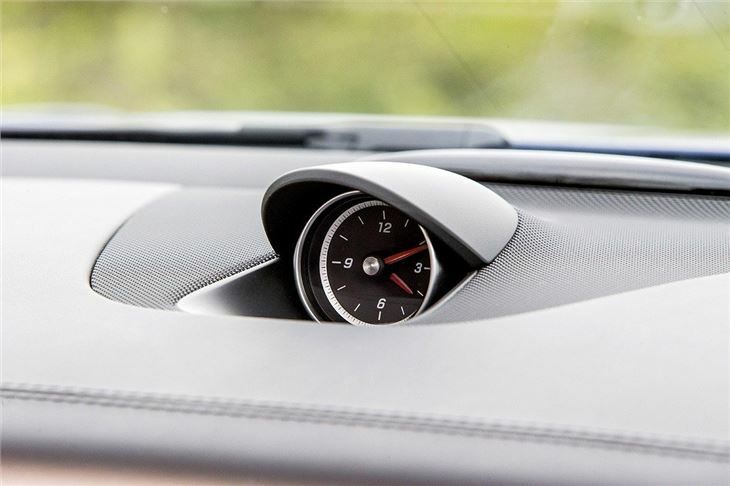 The centre stack in the SLC, for example, is arranged much like it was in the 2007 C-Class almost 10 years ago – including outmoded details like a numeric keypad, despite the advent of voice control via Bluetooth. Practicality is hit and miss too. 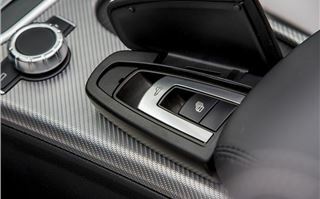 The glovebox isn’t a bad size, but the door pockets are almost useless and – of course – there are no back seats. On the plus side, the electrically operated folding hard top has been improved. Provided the process is started when stationary, the roof will now continue folding on the move at up to around 25mph – perfect in traffic. Furthermore it will attempt to fold down the luggage area protector automatically if the driver has forgotten – though if luggage isn’t placed correctly the process will abort and you’ll have to get out and rearrange things. 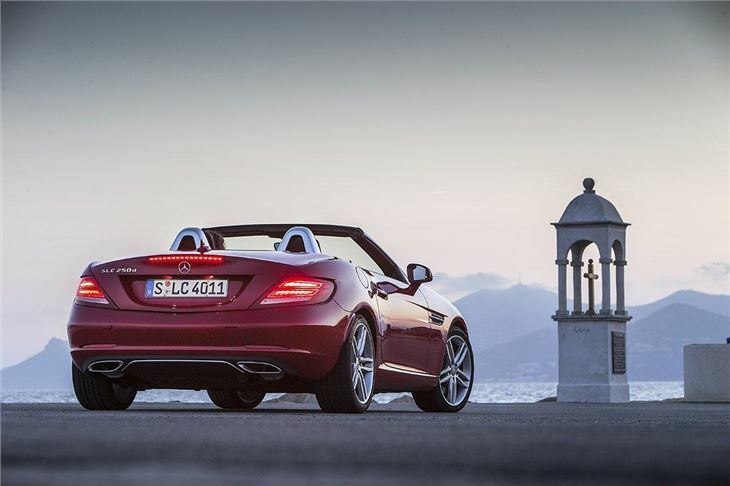 Load volume is 285 litres with the luggage area protector out of the way, but it drops to 180 litres if you want to travel with the roof down. That’s enough for a couple of small cases, fortunately – so owners won’t have to sacrifice open-air motoring for luggage space on a weekend away. 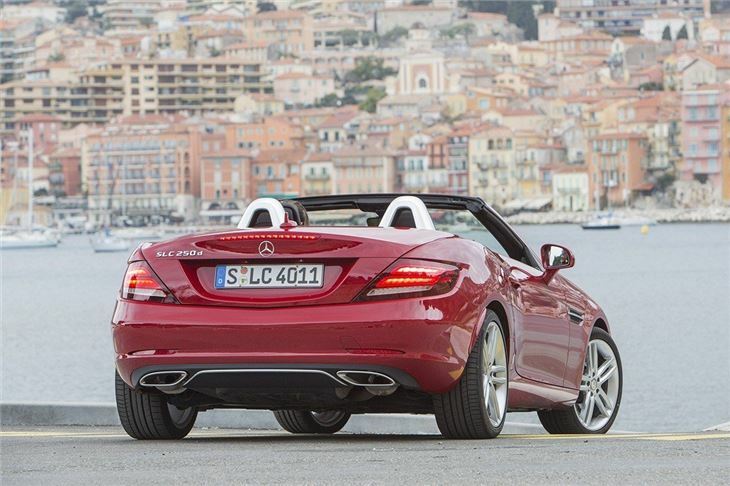 Sadly, with the roof down the diesel engine lets the side down somewhat, with an unpleasant though mercifully subdued exhaust note. As diesel engines go it isn’t particularly coarse or unrefined – but there’s always a nagging sense that a petrol engine would be a better fit, at least in terms of sound. 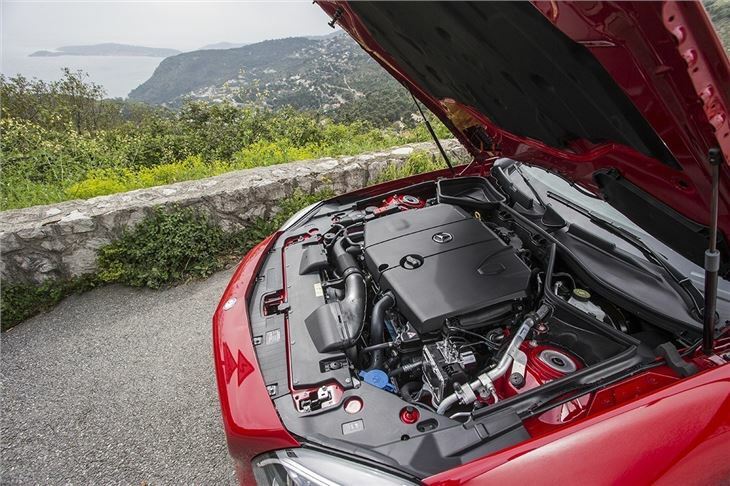 Fortunately the diesel engine doesn't leave you wanting in performance terms – it’s punchy with 204PS and 500Nm of torque, meaning it gets from 0-62mph in 6.6 seconds. 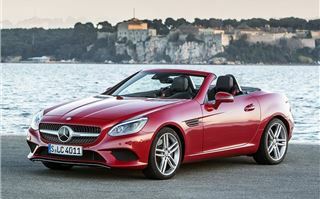 It comes linked to a pleasingly smooth nine-speed automatic as standard - replacing the old seven-speed auto - with a variety of driving modes to suit different roads. 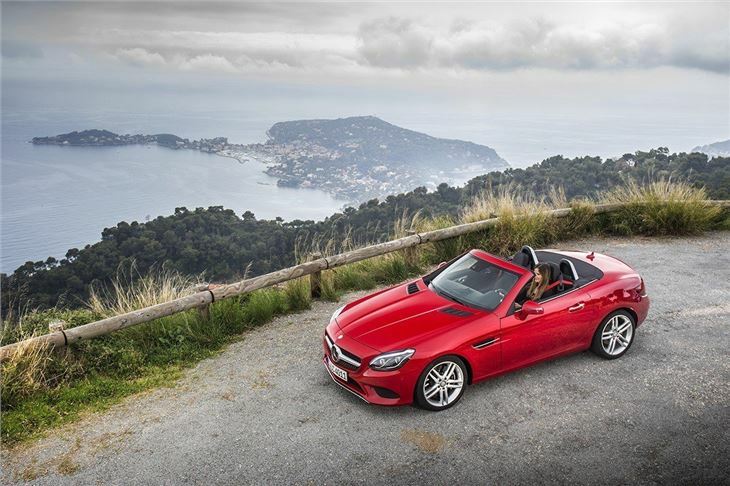 The SLC is compact enough for relaxing town driving, plus it remains fairly quiet on the motorway even with the roof down – but it’s most at home on a twisting country road. The steering is nicely-weighted and precise, the suspension keeps body roll at bay and there is a reassuring level of traction. However, over potholes, lumps and bumps the SLC doesn’t feel as composed or comfy as an Audi TT Roadster, a car that is also great fun to drive. Things do improve if you follow your heart rather than your head and go for a petrol – particularly the new AMG variant. This is powered by a twin-turbo V6 instead of the old V8, which yields better economy and a lower purchase price, yet retains impressive performance and a great exhaust note. It might be expensive, but if you want drama and fun it’s a far better choice than the diesel, plus it has a greater focus on handling, with better brakes and a more precise steering set up. 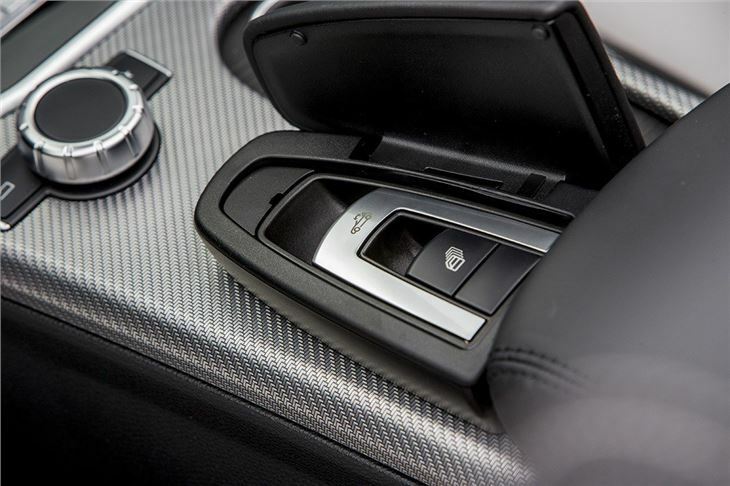 Standard on all SLCs is air conditioning, DAB radio, Bluetooth, Active Brake Assist, auto lights and wipers plus a speed limiter, while AMG Line cars get sportier styling and suspension. 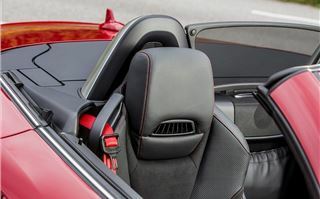 On the options list is Airscarf, which blows warm air around the occupants necks for more comfortable top-down driving, along with safety assistance systems like lane keep assist and blind spot assist. 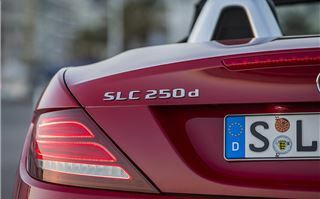 It’s easy to spend thousands of pounds on optional extras for the SLC, which will push the price up close to Porsche 718 Boxster - a much more up-to-date car in terms of dynamics and design. 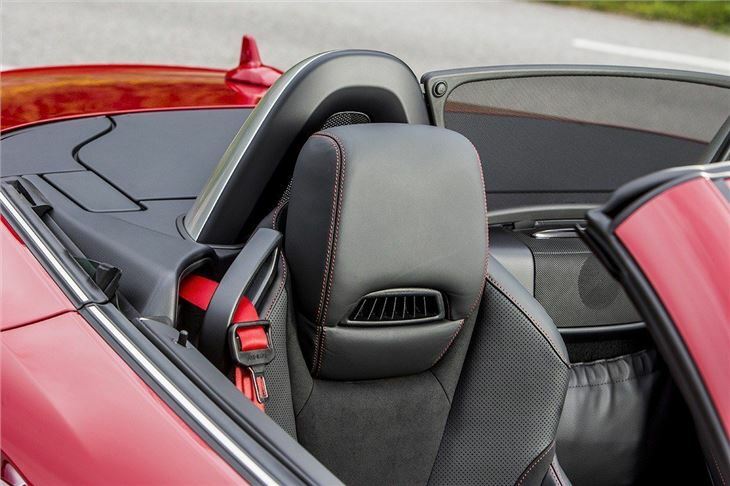 It’s also important to remember the Audi TT, which costs roughly the same as the Mercedes-Benz SLC, yet it has a far classier and more modern cabin. It’s also a great car to drive, especially with quattro all-wheel drive. Plus it too comes with a diesel engine. That leaves the SLC, despite the improvements, in a difficult position. 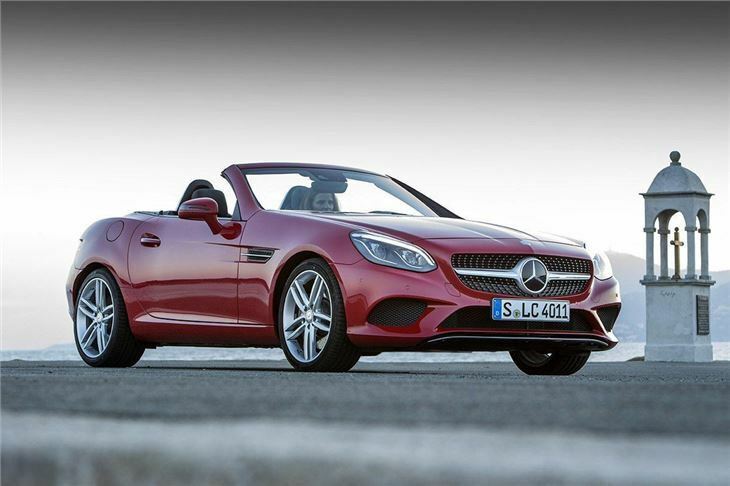 But if you’re looking for a frugal, company car tax friendly two-seat sports car, the SLC 250d isn't a bad choice since its performance doesn’t suffer for the sake of low emissions. Factor in the extra security of its metal roof, as opposed to the fabric tops on its rivals, and it’s easy to see some appeal. Just remember to test its competitors too.